If you’re looking for a well-rounded luxury watch that provides lots of data, a solid reputation, and a sturdy case, you might really enjoy the Tag Heuer Carrera Calibre 1887 Men’s Chronograph CAR2111.BA0720. The brand is synonymous with car racing, having provided dashboard timers for many cars, and has long been favored by drivers and fans of the sport. While I don’t think it’s the the most stylish watch, it might be just right for the man who wants something subtle. The brushed stainless steel is a great finish for everyday wear, and it goes with everything. The 41 mm face has a sapphire crystal for durability, and a double anti-reflective treatment which should reduce glare. The luminous coating on the markers and hands adds to the readability of the watch, which is great when you’ve got so many dials and markers to consider, including the date display and stopwatch function. There’s even a tachymeter scale on the flange. I’d be very impressed if you know how to use that, but even if you don’t, it adds to the look and feel of the timepiece. This watch can record some serious data. On a style note, I particularly liked the concentric rings in the background of the small dials. They added a lot of visual interest to a display that tends towards the monotonously industrial. The Swiss movement should make sure that the data is fairly accurate, although mechanical movements are a tiny bit less accurate than quartz crystals. The mechanism inside the Tag Heuer Carrera Calibre 1887 Men’s Chronograph CAR2111.BA0720 gets particularly high marks from watch afficionadoes. The brand has a lot of fans, who refer to their cherished watches as “Tags.” Such loyalty is inspired by performance across the years, and these timepieces generally compare well to other luxury chronographs. I did see one complaint from a dissatisfied customer who said that the bottom button of the chronometer kept falling off and the crown button came off once, too. He kept updating his review, and despite those issues, he decided he was ultimately very happy with the watch. Since no one else posted a similar complaint, I do wonder if the fault had something to do with the way this man was wearing it–some of us are very hard on our things. 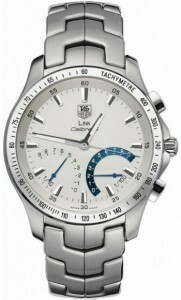 If you like the features, but feel it needs just a little more pizzazz, you might be happier with the Tag Heuer Link Chronograph Quartz Men’s Watch CJF711.BA0592. This model has a touch of blue, and the readouts look a bit like dashboard displays. If you like the basic look of the Carrera Calibre, but want something a lot less spendy, check out the Swatch Irony Quartz Men’s Chronograph YCS549G. The Swatch retails for $175. 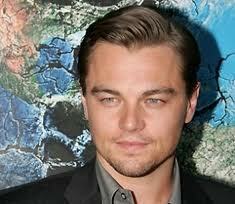 Actor Leonardo DiCaprio is a fan of Tag Heuer watches. The Tag Heuer Carrera Calibre 1887 Men’s Chronograph CAR2111.BA0720 is a reliable timepiece with a lot of bells and whistles, and the stopwatch function can be very handy. This is a watch you’ll come to depend on as a staple of your daily wardrobe, and it’s a lovely choice for a man who wants something tasteful that won’t draw attention to itself. And learn how to use that tachymeter–I dare you.